Life is fun; baseball is serious! 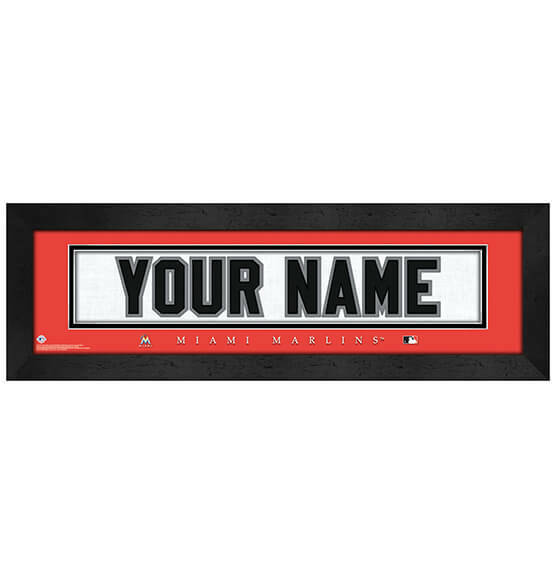 For the serious Fightin' Fish fan in your life, our Miami Marlins Personalized Nameplate Framed Wall Art will have him or her ready for baseball season. This premium-quality print is great for any home, office or fan cave. Designed to look like the back of a Miami Marlins jersey, this custom-printed design is made to order with up to 12 characters of your choosing. Vibrant Marlins team colors and the team's logo are protected with glass and an MDF vinyl wrapped frame for a long-lasting sports decor item they'll cherish. This item comes conveniently ready to hang with a sawtooth hanger.